• Location: River Mile 190.2. • Dam Width: 2,500 Feet. • River Elevation (Pool): 399 Feet. 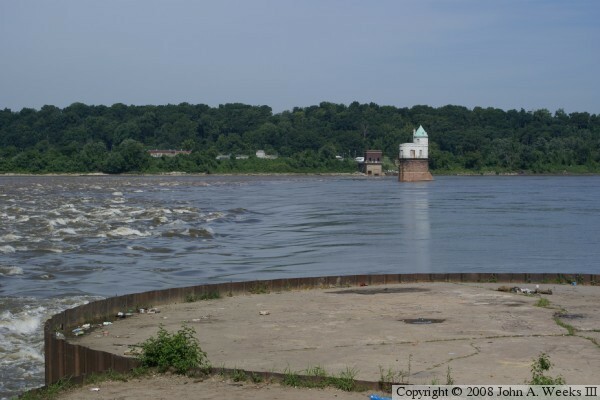 • River Elevation (Outflow): 396 Feet. • Water Fall: 3 Feet. • Date Opened: February 7, 1953. By 1940, the locks and dams from Minneapolis down to Alton, Illinois, were in place and operational. 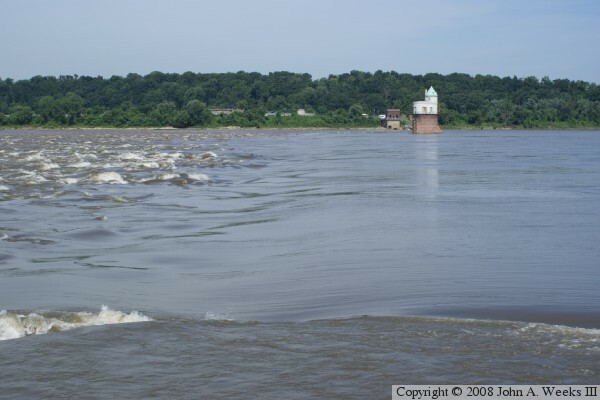 The only challenge to navigation left on the upper Mississippi River was a series of rock ledges and shelves that extended for 17 miles on the north-east side of Saint Louis. Navigation through this area was impossible during lower water, and dangerous during high water. To solve this problem, the US Army Corps of Engineers designed and built the Chain Of Rocks Canal to bypass this area. A low water dam was built just below the north end of the canal. This ensured that the entrance to the canal had sufficient water depth for tow boats. A lock was installed at the south end of the canal. The dam itself has no above water structure. Rather, it was built by dumping many barge loads of rock into the river. The dam is built just south of the old Chain Of Rocks Bridge, once part of historic route US-66. Pictures of the dam and bridge often show two small buildings in the middle of the river. These buildings look like miniature castles. They house the water intakes for the Saint Louis area water purification plant.